"Winter Wonderland" Mt. Tallac, Lake Tahoe, CA. Size Does Matter!! You can see ski tracks in every patch of snow visible on the entire mountain. Extreme skiers descend the face of Mt Tallac via “the Cross”, including the smaller shoots and Cathedral bowl on the left. An avalanche fracture line can be seen below the cross in the lower section of the mountain. There are tracks in the north bowl and in all the trees to the right. Mt. 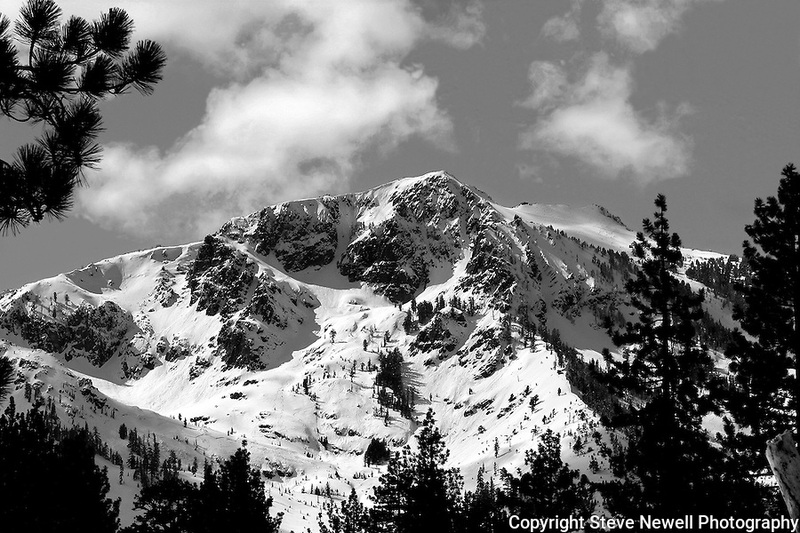 Tallac is a Winter Wonderland to the local mountaineers. I have climbed and skied Tallac many times over the last 29 years. It is truly a spiritual experience to expend the energy to climb the 3000 ft vertical gain and then have the time of your life getting back to your car. No chairlifts just the mountain at it's finest. I started in B/W film in a darkroom and still love it today!! The clarity and detail of the ski tracks and mountain with the vastly different shades of grey make this a Classic "One of a Kind" Lake Tahoe Photograph! !